The YPT Artist Educators Training Part Two: Creating Engagement is for artists and administrators with experience in arts education and a desire to further develop their skills in program development. 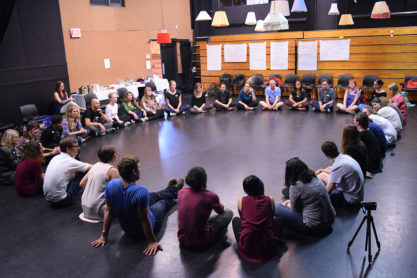 Throughout the two days of training, participants will work alongside one another and in collaboration with invited guests from the community to reflect on what constitutes strong arts education practice and programming. 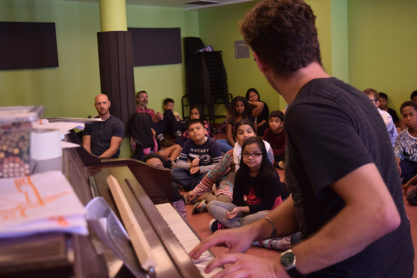 This program will provide professional development for those interested in developing their own arts education projects in school and community settings across arts disciplines. Attending part one of the training is not a pre-requisite, however this training is recommended for experienced artist educators and arts administrators. This program is made possible through funding from the Ada Slaight Education Centre at YPT and the Ontario Arts Council. If you have questions, or to apply for a bursary or travel subsidy, contact Aimee Bouchard, Community Programs Manager at abouchard@youngpeoplestheatre.ca or 416.363.5131 x216. Artist Educators Training at YPT, September 2016.